The snow make-up day for February 20 is Thursday, April 18. The Donegal School District would like to announce two changes in the 2019 School Board meeting schedule. The meeting originally scheduled for Thursday, May 9, 2019, has been changed to Thursday, May 16, 2019, and the meeting originally scheduled for Thursday, June 13, 2019, has been changed to Thursday, June 20, 2019. The meetings will be held at 7 p.m. in the Donegal Primary School LGI located at 1055 Koser Road, Mount Joy, PA. If you have a student who will be entering Kindergarten for the 2019-2020 school year and you have not completed a census form this year, please provide your mailing information to assure that you receive important updates regarding Kindergarten Registration. Click here to be added to the Kindergarten Registration mailing list. The Donegal School District will actively engage all segments of the community to provide a well articulated curriculum that results in high achievement for all students from early childhood through secondary. Quality facilities and learning resources will be supported while maintaining fiscal soundness and promoting positive morale. Developing each learner as a productive citizen who thoughtfully meets personal, community, and global challenges. The Donegal Power Packs Project will again distribute food packs from the Primary and Intermediate buildings on Thursdays, at the end of the school day, during the 2017-18 term. Enrolled students can pick up their pack which contains a helpful tip sheet, a recipe and the main ingredients to make that meal. Students MUST submit a new form each school year to participate. Enrollment packets will be sent home with students the first week of school. This non-profit, community run project is in need of additional volunteers. This valuable project NEEDS YOU to be successful. Follow us on Facebook, “Power Packs Project-Donegal Affiliate”, for additional information, or contact the team by email at donegalpowerpacks@gmail.com. You can also find our information at www.donegalfoundation.org. 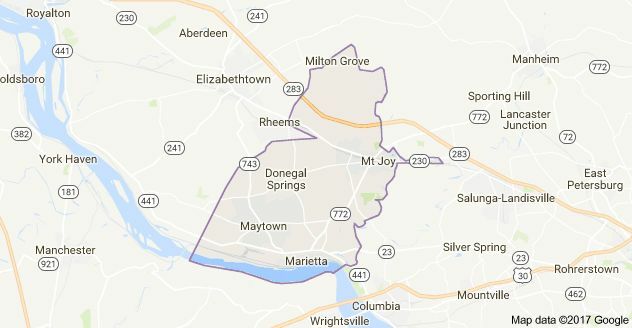 The Donegal School District is comprised of three unique communities: Marietta, Maytown and Mount Joy. While each community has its own special characteristics, when the three become one, an even stronger community exists. This is the Donegal School District. Our school community takes great pride in our students and their accomplishments. It is through a high level of cooperation and collaboration that we are able to take three and become one. It matters not from where you come, once you get here, you understand the strength in being Donegal Proud! The Donegal School District is a member of Lancaster-Lebanon Intermediate Unit (IU) 13. The district operates one high school, one junior high school and two elementary schools.